Hurricane Katrina revealed that our government was ill-prepared to assist the most vulnerable people at a time of dire need, and that unequal opportunity remains a major problem in America. Tragically, the reconstruction of the Gulf Coast region is perpetuating, rather than addressing, these problems. 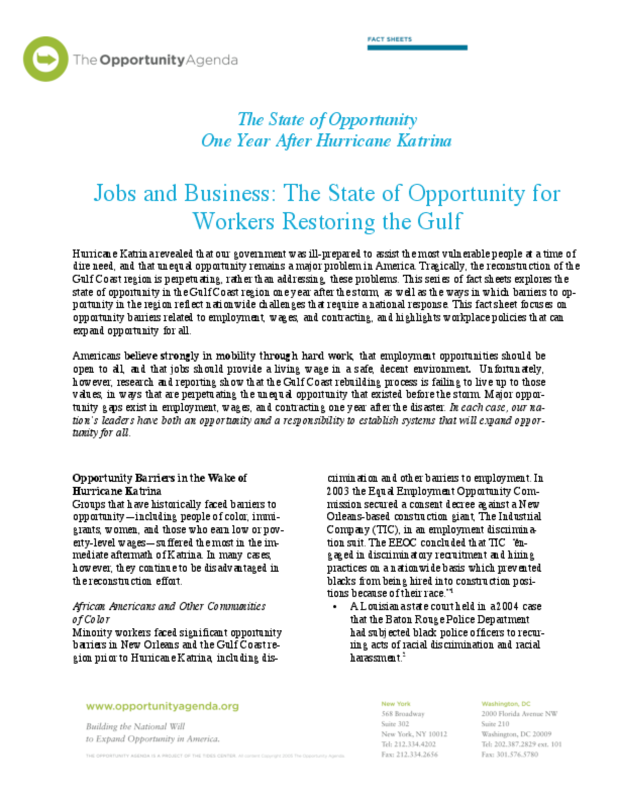 This series of fact sheets explores the state of opportunity in the Gulf Coast region one year after the storm, as well as the ways in which barriers to opportunity in the region reflect nationwide challenges that require a national response. This fact sheet focuses on opportunity barriers related to employment, wages, and contracting, and highlights workplace policies that can expand opportunity for all. Americans believe strongly in mobility through hard work, that employment opportunities should be open to all, and that jobs should provide a living wage in a safe, decent environment. Unfortunately, however, research and reporting show that the Gulf Coast rebuilding process is failing to live up to those values, in ways that are perpetuating the unequal opportunity that existed before the storm. Major opportunity gaps exist in employment, wages, and contracting one year after the disaster. In each case, our nation's leaders have both an opportunity and a responsibility to establish systems that will expand opportunity for all.